What is your Beach Style? Listening, you hear the waves and wind, mixing softly with the songs of playful gulls. Soaking it in, you’re left with only a sense of calm. Looking out, you see the sparkling ocean, stretching out endlessly toward the sky’s blue embrace. You are just the place you need to be. Along Delaware’s sunny coast, each town carries this gentle air of serenity but also boasts its own style. 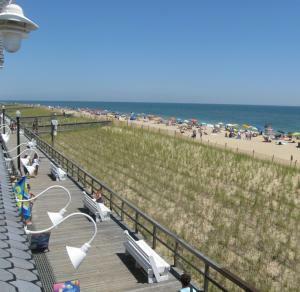 Both the young and young-at-heart enjoy Rehoboth Beach’s gentle, food-focused grace, or Dewey Beach’s full-tilt fun. Others seek the solace of quiet seaside towns such as Bethany Beach or Lewes, or crave the home-away-from-home, family feel of Fenwick Island. 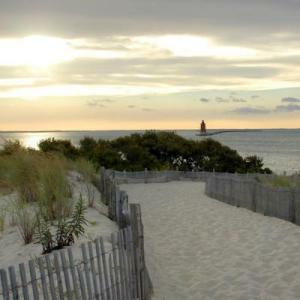 No matter your beach style, Delaware’s beaches offer miles of memories. The quiet, soothing streets of Delaware’s most historic town are perfect for those days when it’s just the two of you, in search of that cherish time spent browsing, dining or strolling along the canal through a sea-scented evening. Follow the pathways through sand dunes, and you’ll find it. The Point at Cape Henlopen. It reaches toward wave-lapped lighthouses standing where bay meets ocean. Listen to the seabirds drift overhead, the breeze blowing by and the surf rolling in. You have arrived. There’s an artsy, edgy sort of sophistication here but also enough simple joys to make it one of the East Coast’s most family-friendly beach towns. After a day of fun in the sun, follow the sandy footprints to the fun food, shops, games and rides of the famous boardwalk of America’s Summer Capital. Sleep by day, celebrate by night. This just-south-of-Rehoboth sea town is for the young-at-heart, making its nightclubs and bayside restaurants the Delaware beaches’ best places to get your party on (or jet-ski the day away). On either side of the Coastal Highway, sunshine glints off broad waters that beckon all who cherish a natural, peaceful ambiance. In the park’s inland bay, boaters make their own waves, while on the ocean side, beach bathing and skimboarding keep the whole family happy. Here’s the place to gather the whole family in a spacious beach house for a week (or two?) of restful, sand-in-your-toes seaside living. The boardwalk keeps kids entertained; moms and dads, aunts and uncles will rejoice over plentiful family-friendly restaurants. With a state park just next door, the bay as your backyard, and a beautiful beach for kicking back, it’s no wonder this familiar and laid-back beach town has become a family favorite for generations. For generations, the Delaware beaches have made millions of memories out of just three simple things: The sea, the sand, and the seafood.